Quite a lot of women appreciated the positive hormonal effects. One ashwagandha fan stated that every other brand they have tried were not as good as this one. One reviewer suggested that the dosage was a bit too strong for her. Another user said they felt no effects. Pure Encapsulations Ashwagandha is one quality product that provides effective results. Designed to be higher quality than most other 3rd party supplements on the market. A trusted brand, a clean ingredient profile and effective dosages provides a quality experience. 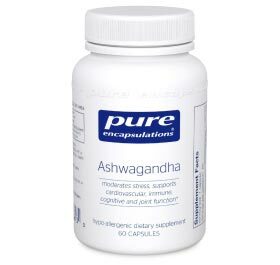 If you’re looking to try ashwagandha and want to purchase from a brand that you can trust, Pure Encapsulations Ashwagandha is the way to go. Overall, Pure Encapsulations Ashwagandha is considered to be one of the top ashwagandha products on the market. Pure Encapsulations is known in the supplement world for producing very high quality products. Doctors often recommend this brand when referring patients to over the counter supplements. Ashwagandha content measured in at 500 mg of extract per serving. Ingredient profile is clean, no random binder or filler additives. Contains 2.5% withanolides the desired ingredient within ashwagandha that makes it effective. One serving of this product recorded 500 mg of ashwagandha root extract containing 12.5mg of withanolides. Studies show that the benefits of ashwagandha tend to appear around this dosage. Benefits may include, reducing the effects of stress such as low-energy, weaker immune system, and overall mood. May help support cardiovascular and cognitive function. Extremely reputable supplement company. Highest quality ingredients are always used.